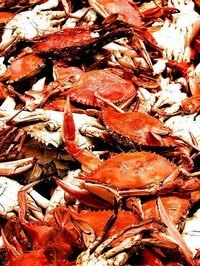 Hard shell crabs are typically prepared by boiling in a pot with various seasonings. Once boiled, the shells can be cracked and the succulent meat can be pulled out and eaten, or used in recipes calling for crab meat. These crabs only consist of about 15 percent edible meat, so larger quantities must be prepared. This recipe prepares two dozen hard shelled crabs and will serve four to six people. Pour 6 qts. of water into a large stock pot. Add 3 tbsp. of liquid crab boil, 2 cups of salt, ¾ cup of lemon juice and 10 drops of Tabasco sauce to the water. Bring to a rolling boil. Allow the mixture to boil for 10 minutes, and then dump 24 live hard shell crabs into the pot. Allow the crabs to boil for 15-20 minutes, or until they turn bright red in color. Remove the crabs from the pot and drain any excess water. Let them cool to room temperature, and then transfer into large bowls. Cover the bowls tightly with plastic wrap. Place them in the refrigerator for 2-3 hours, or until the crabs are thoroughly chilled. Remove the bowls from the refrigerator and take off the plastic wrap. Serve the hard shell crabs cold, or use a nutcracker to remove the meat from the shell, and use for a recipe. If liquid crab boil is not available, add 1 tsp. of allspice, 10 cloves, 1 tsp. of dried thyme, five bay leaves, 1 tsp. of celery seed, ½ tsp. of dried mustard and 1½ tsp. of black pepper to the water before boiling. Reduce the amount of Tabasco for a less spicy flavor, or remove it all together if desired.